Cradle Inn Daycare has been in operation since 2000 and we have found that we needed to grow in order for more children to experience that quality “in home” daycare option that most parents find suitable for their family. We have moved to a new location and are now “Cradle Inn Daycare Center”, conveniently located on the Westbrook/Gorham line on route 25. We continue to promote the “in-home” daycare atmosphere that has been so popular for so many children (and parents) for the past 17 years. 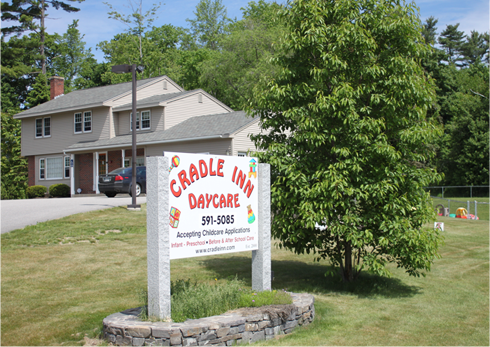 If you're looking for a daycare provider in Southern Maine, Cradle Inn is a Great Choice! Our primary mission is to give each child- individual personal care, as well as a nurturing and stimulating environment that allows them to attain their full potential. We are committed to supporting caregivers through on-going training, fair compensation and career advancement opportunities. We believe that children are our most valuable resource and deserve the very best opportunities possible to develop their natural skills. We believe in having a fun atmosphere, and being in an environment which is safe, nurturing, stimulating and developmentally challenging. We emphasize the importance of trust, positive social interactions, self-esteem, respect for others personal health and hygiene practices, and communication skills. My 20 month old son attended Cradle Inn for a short period of time that we lived in Gorham. He attended full time in the toddler room. Dan and Karen Flannery have been wonderful. From the first call and visit, they were very informative and welcomed all of our questions. The Flannery's keep parents informed by sending regular emails, updating their website and are always available on a daily basis. The teachers in the toddler room were so positive and treated everyone with great respect. I was always greeted with a smile when dropping off my son and a smile when picking him up. My son was fed healthy and nutritious foods every day. He now sings his ABCs, does some counting, knows some sign language, holds crayon's correctly, sings many songs, and says "thank you." These are only a few of the many things he has learned since attending Cradle Inn. Our whole experience at the daycare has been very positive and we recommend to any family that is looking for a high quality childcare.